"This is a book with no pictures. It might seem like no fun to have someone read you a book with no pictures. It probably seems boring and serious. Except... Here is how books work: Everything the words say, the person reading the book has to say. No matter what." 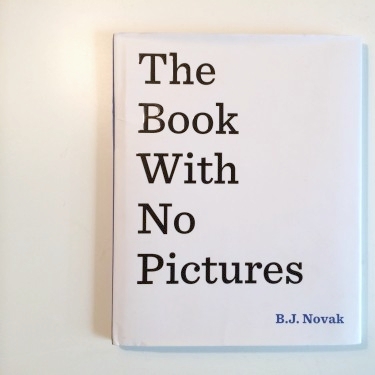 B. J. Novak of The Office fame presents a delightfully ridiculous take on the standard picture book. As indicated by its title, Novak takes a polar position to the increasingly popular wordless picture book by giving young readers a book without illustrations. The book needs to be read aloud to be best enjoyed. The goal of the story is to make the adult narrator look as silly as possible as they are forced to perform line after line of nonsense to children, exactly why children love it so much. Some of the lines are jumbled nonsense, some praise the child who is listening, but everything is intended to make kids laugh. If you don't like performing books when you read aloud to children and opt to simply read them instead, then this isn't the book for you. Reading the book in a monotonous, straight tone would completely miss the point. If, however, you don't mind raising and lowering your voice, speeding up and slowing down, and playing the role of victim to the sillyness, you will like this book. Your kids will love it even more.